The Bushnell Tour V3 JOLT laser rangefinder is fast, accurate, and built to last. Since Bushnell released it in 2013, I’ve seen it often on the courses I frequent. Some of my golfing buddies refuse to upgrade because the Tour V3 simply does just what they need. The Bushnell Tour V3 comes in Standard and Slope Editions similar to TecTecTec’s VPRO500 and VPRO500S. Both Tour V3 versions have the same features, except that Slope measures vertical height, not just line of sight distance. I’ll review them both so you can choose which one works best for you. Those are just the basic reasons why this is a good, solid rangefinder. I took it out for a test spin and I’ll share with you what I discovered. I played 18 holes with the Tour V3, the front 9 with the Standard, and the back 9 with the Slope Edition. Here is what I noticed. The Bushnell Tour V3 fits nicely in one hand and has rubbery grips on both the top and bottom. The eyepiece also has a rubbery feel. The focus adjuster is tight, so I knew once I had the focus right, it would stay put. The 5x magnification makes for a clear, steady view down range. It wasn’t hard to aim at objects up to about 300 yards. After that, it was a little difficult to range narrow targets like the flag. But I’m getting ahead of myself. Let me tell you first how this rangefinder works. There is a single button on top that controls all of the V3’s functions. One press and the rangefinder is powered on and ready. The next press of the button fires the laser. Use the circle to select your target. While the laser is firing, crosshairs appear on-screen around the circle. They disappear once the target is acquired and locked. The line of sight distance to the target displays for about 15 seconds after you release the button. If you target the flag (or any other specific place like a sand bunker), the JOLT feature vibrates the rangefinder to acknowledge that it’s locked on, and the icon of a flag with a circle around it appears on-screen. 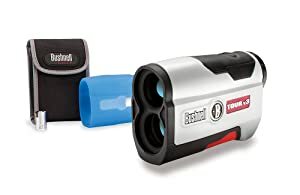 Other laser rangefinders like the VPRO500 from TecTecTec also offer something like PinSeeker that search for the flag, but none of them acknowledge the lock in a way you can feel. The Tour V3 was the first to add this haptic feature. The distance readings I took while testing matched the readings I already had on record for testing purposes, so there’s no question that the Tour V3 is accurate. I didn’t notice any lag in displaying distances. Everything was speedy. It took about a minute to range five different targets. There was only one thing that occasionally happened. Sometimes, at distances over 200 yards, the Tour V3 didn’t seem to lock on because there was no flag icon and no JOLT. But if I held down the button and held the rangefinder focused on the target, the yardage displayed was accurate. Overall, I was pleased with the speedy performance of the Tour V3. Now it was time to try out the Slope edition. At the tenth hole, I switched to the Bushnell Tour V3 Slope Edition. I’m a big fan of rangefinders that can read vertical height. I’ll tell you why. The slope-reading feature on the Slope Edition makes it easy to choose the right club for the play. It’s hard to eyeball slope, especially when it’s a couple hundred yards away. The rangefinder combines the horizontal distance with the amount of elevation or declination, and shows a compensated range so you know how to play the shot. You’ll finish each hole with fewer strokes, even on an unfamiliar course. 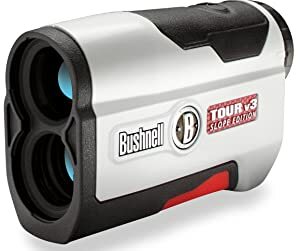 A rangefinder like the Bushnell Tour V3 with Slope is worth the investment even if you can only use it for practice rounds and not tournament play. You’ll shave strokes off your handicap, guaranteed. The Bushnell Tour V3 Slope Edition handles just the same as the Standard. Press the button to power on, press again to range a target. But this time, there is more information displayed on-screen. Below the line-of-sight distance is the vertical height in degrees with a triangle pointing to a second yardage. That second yardage is the “play-as” distance. On the 16th hole, the Tour V3 Slope Edition kept me out of a sand bunker. It showed that the drop ahead of me was about 4 degrees. I chose a 7-iron instead of my 8-iron, and landed just short of the hazard, right on top of the green. The Slope Edition performed equally well as the Standard Edition. The compensated distance information it showed was easy to understand and it matched what my Bushnell Tour X reported. Now that the round is over, let’s sum up the pros and cons of the Tour V3. 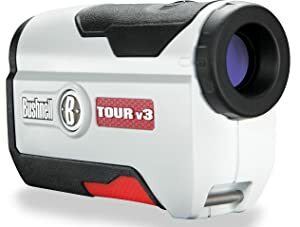 Although the Bushnell Tour V3 has been surpassed by newer products, it’s a reliable, easy-to-use rangefinder that’s still very popular and seen on courses around the world. If you’re a serious golfer looking for a fast, accurate, dependable laser rangefinder, the Tour V3 Standard Edition is a great value. The Slope Edition is highly recommended for golfers who want to lower their handicap. For a limited time, Bushnell offers Patriot Packs. These special edition packages offer a protective sleeve for the Tour V3. The Standard Edition includes a blue Skinz silicone sleeve, while the Slope Edition comes with red. A portion of the purchase price of each Patriot Pack funds the Fold of Honor Foundation. They grant scholarships to the family members of soldiers who were killed or disabled while serving.